Yesterday I arrived mid heat and hurry. I dashed ‘toute de suite’ to the Biltmore and made reservations. Saw ‘The Trial of Mary Dugan‘ in the afternoon and ‘The Show Boat‘ il soir. Both were ‘tres bons’. Saw [today] the Metropolitan Museum and walked blocks therein. Made the rounds of NY by bus, and then went to ‘Dawn‘. Tonight went to ‘The Silent House‘ sparky and good. Went to bed! Slept all night. So ended the beginning of my trip abroad! The first all-talking motion picture, Lights of New York, is shown in New York (it would go on general release on July 18). Meanwhile, the world’s largest record hailstone 1.5 lbs (7 inchs in diameter) at the time falls in Potter, Nebraska. 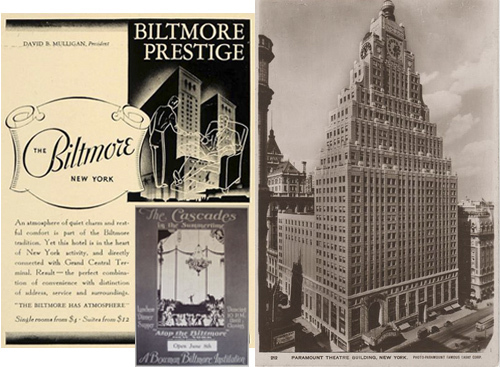 The New York Biltmore Hotel was part of Terminal City, a massive complex of hotels and office buildings connected to Grand Central Terminal. For 23 years the New York Biltmore was the home to the Grand Central Art Galleries, founded in 1922 by John Singer Sargent, Edmund Greacen, Walter Leighton Clark, and others. It was also part of the Bowman-Biltmore Hotels group, which also included the Los Angeles Biltmore, which housed bandleader Earl Burtnett’s orchestra. Here’s a clip featuring the Tiger Rag, a tune that originally came out in 1917, but was still very popular in 1928. [sic] We have kept all spellings as Vincent wrote them. [nb:] The pictures on this page were sourced as free media use and are not from Vincent’s estate. This entry was posted in USA, Vincent Price 1928 Travel Journal and tagged 1928, Biltmore Hotel, Broadway shows, New York, New York City, Vincent Price Legacy by Peter Fuller. Bookmark the permalink. And thank you for reading. New posts every two days until 26 August. Thanks for that Lucy. If you see any more, then do let me know. 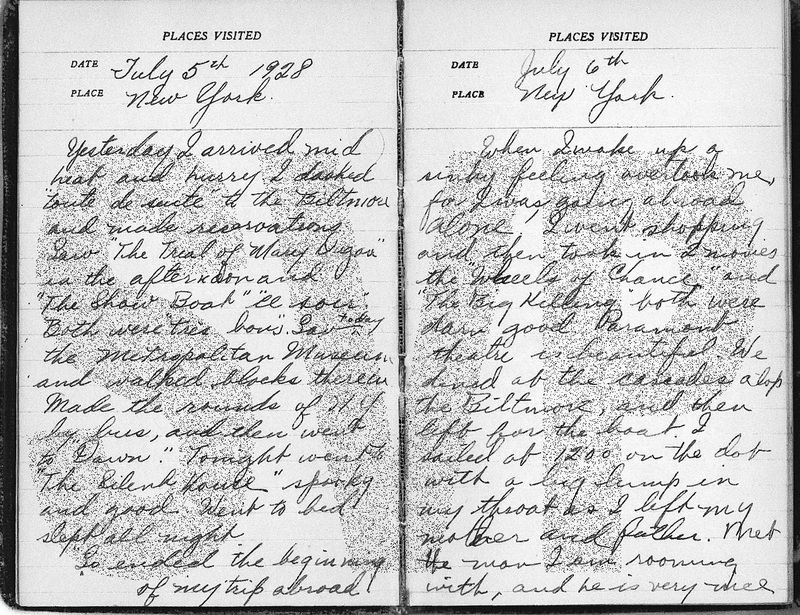 It was a bit of a challenge understanding his handwriting. I hope this side comment about Vincent Price literally behind the scenes has some interest: Many years ago, he was in Wilmington, Delaware for some reason I’ve long forgotten and agreed to do a TV interview. Since I was then (and still am) the film critic for WHYY TV in Philadelphia, the station wanted me to do the interview even though I was an hour away when we got the last minute notice. He was early–out of professional courtesy–and I couldn’t get there for quite some time. In spite of sitting in a small studio waiting for all of that time, when I arrived breathlessly and did the interview, there was no impatience, sign of resentment or boredom, or lack of energy from a man used to star treatment. In summary, he as a gentleman. omg, there is a journal?? I didn’t even know! Thank you so much for posting this! Yes there is. Please do follow and share with your friends.